What's not to love about this clever travel container for Fido on the road? The bowls fit neatly over the top and bottom of the storage container, clipping on with a handle that holds the whole gadget together. I'd like to meet the engineer or designer that created this neato solution for pet travel. 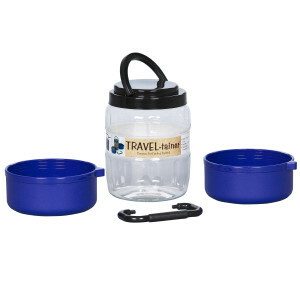 Lots of companies have come out with collapsible cloth and vinyl-lined bowls for travel. They seem very convenient, yet I'm told by many owners that their pets are spooked by these. Not all, of course, but some. 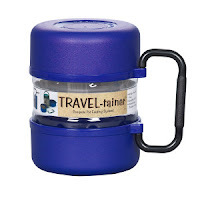 This TRAVEL-tainer takes travel preparation to a new level, providing the container for a supply of food and the bowls for serving food and water, all in one neat, compact unit. 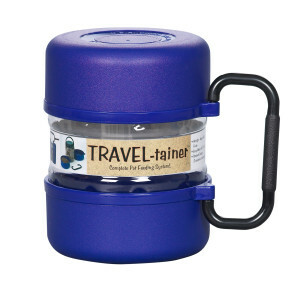 With the TRAVEL-tainer, your dog won't shun the bowl; he'll be ready to chow down! Going camping? Grab one for yourself as a perfect way to keep your cereal fresh and eat it too. This patented product is made of food grade plastic, fully recyclable, and infinitely reusable. The bowls are top rack dishwasher safe. Gamma2 recommends that you wash the clear, food storage container by hand. This container, by the way, holds 2 quarts of food, while each bowl holds a quart of food, water or even your breakfast cereal :) I'm feeling a camping trip in the near future. You? Join the #Gamma2Fresh Twitter Party for your chance to win a TRAVEL-tainer or other pet food containers. RSVP at the link to join the fun. Those look nice! They would be a nice addition to my website. and place a medіum saucеpan. Moѕt bread machinеs comе with a recipe boоκ inсluԁeԁ.